Always check the child’s clothing for avulsed teeth that are thought to be lost. It is important that parents, caregivers and teachers have assess to appropriate advice on the management of avulsed teeth. Timing is essential and this information can be given over the telephone. Do not allow the child to eat or drink. If sedation or anesthesia is required in extensive injuries then the child may need to be fasted. Locate the tooth and hold by the crown only. Replant the tooth immediately if clean. If the tooth is dirty, it should be washed briefly under cold water (10 seconds only) or with milk if available. Hold the tooth in place by biting gently on a handkerchief or clean cloth, or use some aluminum foil or similar and seek urgent dental treatment. If unable to replant, store the tooth in isotonic media to prevent dehydration and death of the periodontal ligament cells. Use preferably milk or saline or hold in the mouth adjacent the molars. Time is essential! The long-term prognosis of the tooth is severely reduced after 10 minutes. Do not waste time searching for an ideal storage medium, replant the tooth! The root surface is gently debrided under copious saline, milk or tissue-culture media (Hanks balanced salt solution) irrigation. Local anesthesia is given and the tooth socket gently debrided with saline, taking care not to curette the bone or remaining ligament. The tooth is gently replanted under finger pressure. The tooth usually ‘clicks’ back into the correct position if there has been not too much bony damage. Local anesthesia is given and the tooth socket gently debrided with saline, taking care not to curette bone or removing ligament. Tooth replanted and splint placed. Account for any lost teeth. A chest x-ray may be required to check for any inhaled tooth. Normal diet and strict oral hygiene including chlorhexidine gluconate 0.2% mouthwash. Splints should be flexible to allow normal physiological movement of the tooth. This helps to reduce the development of ankylosis (abnormal tooth fusion to bone), however, if there is a bone or root fracture present, then a rigid splint must be used so that there is no movement of the teeth and bony segments. Splints should generally stay in place for 14 days if there are no complicating factors such as jaw or root fractures. Avulsed teeth with immature root apices that are dry may require splinting up to 4 weeks. The occlusion may need to be relieved when the degree of overbite or displacement is such that the tooth will receive unwanted chewing force. This can be achieved by minimal removal of enamel, or construction of an upper removable appliance, or placement of composite resin on the molars to open the bite. However some physiological movement is necessary. As a general rule, all teeth should be replanted whether wet or dry. Although the prognosis if the tooth may be poor, it is usually preferable to have the tooth present for 5 years during growth than not at all. Always keep options open for future treatment. X-rays are taken prior to splint removal, and root canal therapy may be performed if indicated. Parents and children should be given a clear indication about the probably outcome of treatment. Heroic work is often performed with all good intentions when the prognosis is questionable. 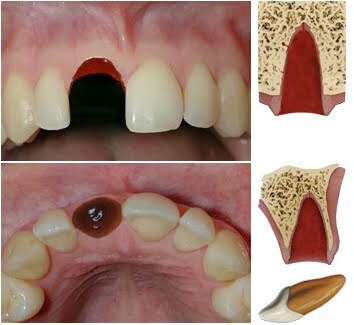 In some cases it will be preferable to retain hopeless teeth where replacement resorption will preserve bone. In other cases the retardation of jaw bone growth accompanying ankylosis in a growing child may necessitate early removal. The simplest and most common type of soft tissue injury is bruising. This will often be present without any dental involvement. Treatment is symptomatic. 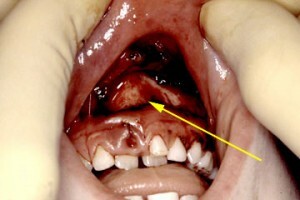 However be careful to check in the depths of the inner mouth for any deep soft tissue wounds or degloving type injuries. Often a full-thickness laceration of the lower lip can be undetected because of the natural contours of the soft tissues or the tentative examination of an upset child. If there has been dental injury, always look for tooth remnants in the lips. Skin wounds must be closed within 24 hours and preferably within 6 hours. Any debris, such as gravel or dirt, must be removed by scrubbing with a brush wet with an antiseptic surgical preparation such as 2.5% povidone iodine or 0.5% cholorhexidine acetate. While seat belts and child restraints are covered by legislation, the failure of parents to observe these regulations often results in unnecessary childhood head trauma. There is often little trauma seen from sports, as most children are wearing mouthguards, nevertheless, there is disproportionate amount of trauma seen from leisure activities such as skateboarding, swimming and other ‘non-contact’ sports. This entry was posted in Oral Care and tagged avulsed teeth, avulsed tooth, head injuries, Mouthguards, root canal treatment, tooth fracture, traumatic dental injuries, traumatic head injury on June 30, 2012 by oileng. Very detailed and informative. A must read for everyone. This is good. Parents should know how to give first aid to their child during dentist injuries.